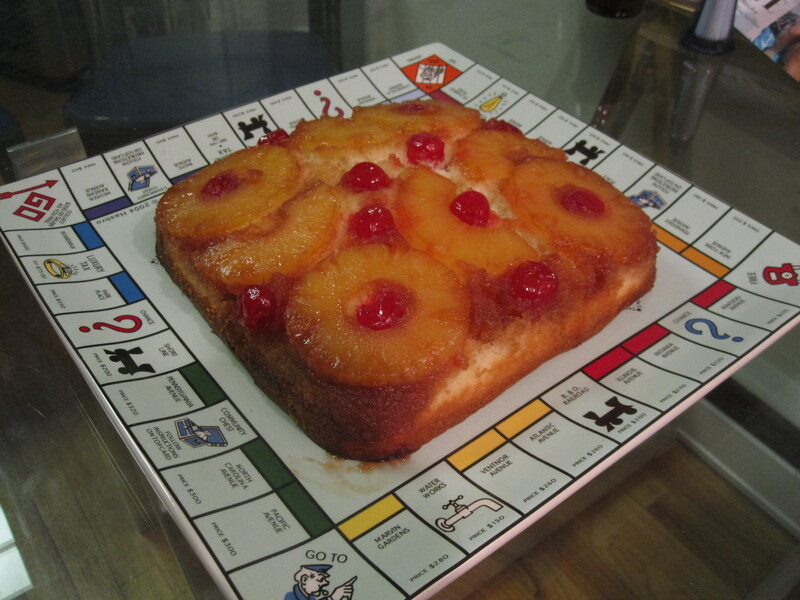 A recent episode of the daytime cooking show, “The Chew” inspired my Mom to try out a new recipe of her favorite childhood cake: Pineapple Upside Down! The recipe we used is actually from the gorgeous Eva Longoria (I find it hard to believe she can look like that and eat cake!!) who published her own cook book “Eva’s Kitchen” last April. I could tell my Mom was really excited because we normally don’t make cakes from scratch… in fact I don’t think I ever have! She even went out and bought us cake flour. First, we preheated the oven to 350. The recipe calls for you to use a flameproof cake pan and melt butter and sugar in it, over the stove. Instead, we used a saucepan… melting 1/3 cup of butter over the low heat… then mixed the brown sugar in. It takes a while to constantly stir the sugar/butter until it is completely blended, without any pools of melted butter ontop. It took about 4 minutes. 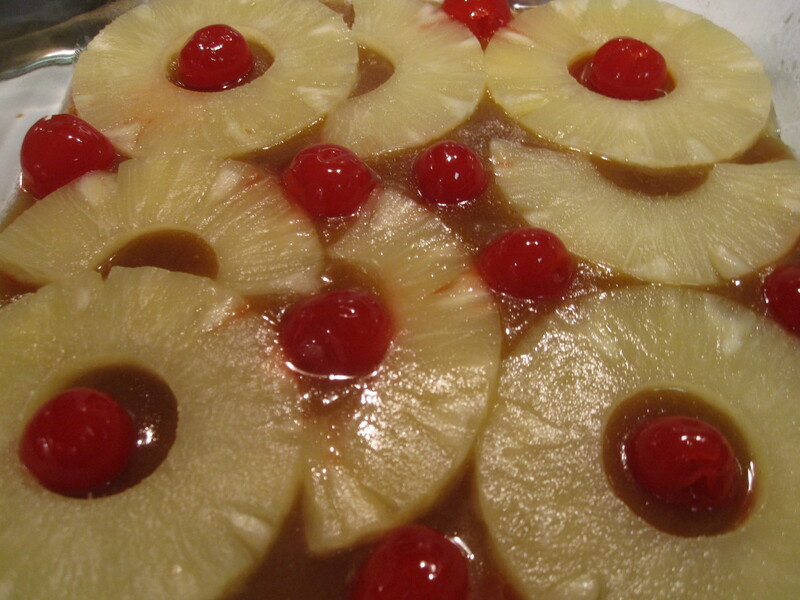 Next, we poured the caramel in a baking dish… and here’s the fun part: Arrange the pineapple decoratively ontop of the caramel. We decorated with lots of Maraschino cherries too! 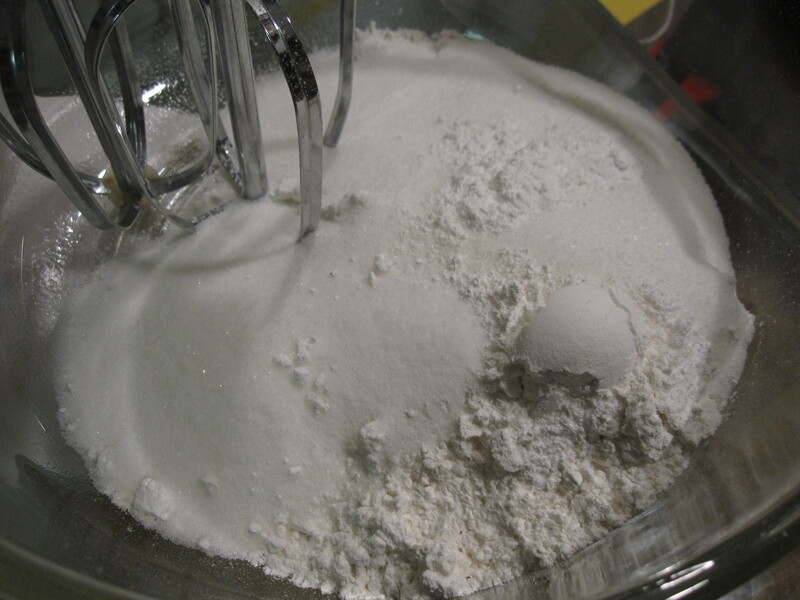 Dry ingredients- mix on LOW! Next, we added the remaining 1/3 cup of butter, milk, and vanilla. 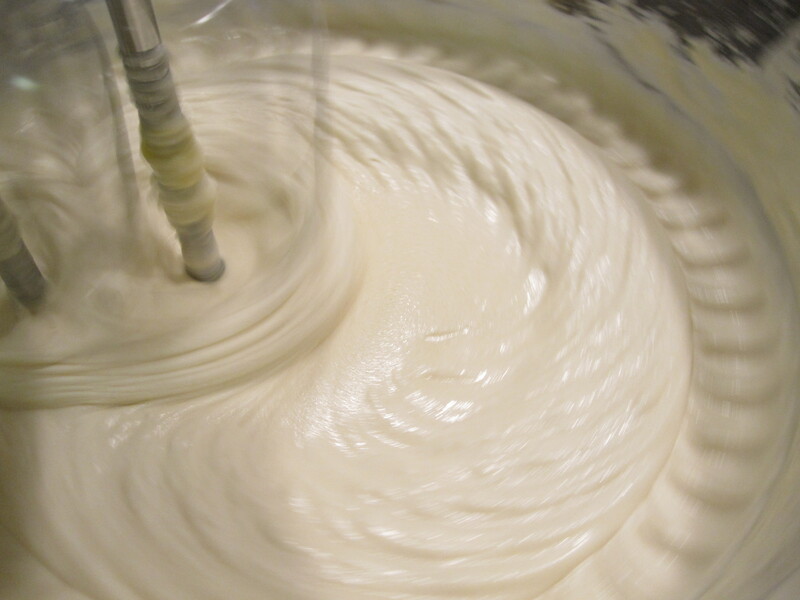 We beat in the mixer on medium speed for about two minutes before adding the egg and beating for another two minutes. 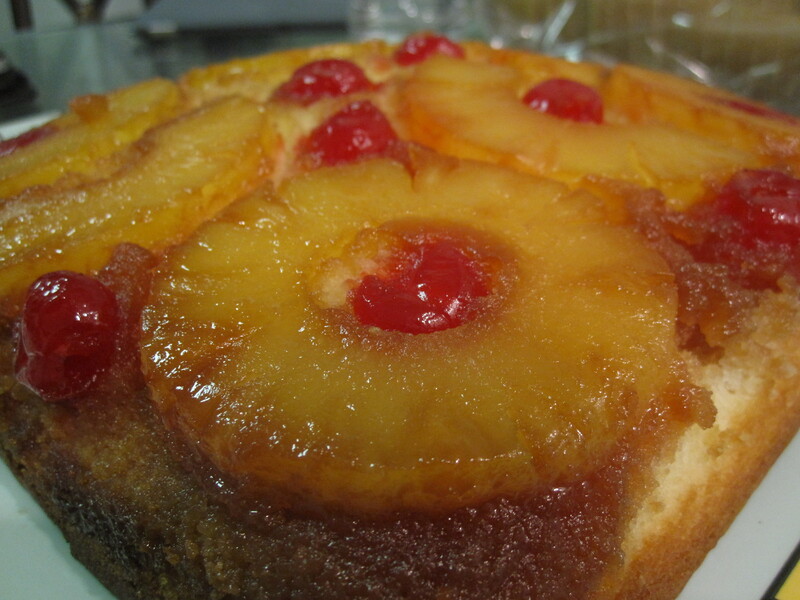 Finally, the batter gets poured over the pineapple. Remove the baking dish from the oven and tilt it in all directions, releasing the cake from the sides of the dish. Cool in the dish for 3 minutes. Turn the pan over onto a serving plate and let stand for another 2-3 minutes. Carefully lift the pan off the cake. Ours turned out fabulous, with the exception of the giant crack down the middle! We put the cake back together and served it to our family… everyone loved it. The best part were the sides of the cake where the caramel reached and cooked right into it. The cake itself was so fluffy and light and so flavorful. My favorite plate we own!! If you want to be more adventurous, try to replace some of the milk with pineapple juice from the can! I would also suggest making more caramel if you would like your cake to be even gooier than ours! Thanks!!! It was DELISH! …. I have a Boardwalk coffee mug to go with it too!! !